When looking for an automobile, keep in mind there are many factors which affect the price of a used automobile. The four main factors are: who is selling it (discussed earlier), the condition of the automobile, the options it has, and supply and demand. 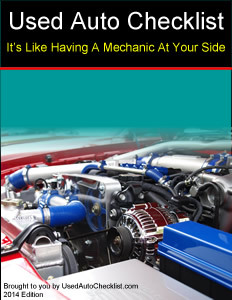 The condition of the automobile and how it affects the price is fairly self-explanatory. It's easy to understand a dent lowering the price, but how do you figure in mileage? The average mileage for an automobile is 12,000 a year. Any more than that will lower the price. Any less than that will raise the price. Check the “Blue Book” in the library or go to UsedAutoChecklist.com for links to find this information. Note: It is nearly impossible to prove if the mileage on an automobile, even one with a digital odometer, has been tampered with. You can check for inconsistencies though. One thing to check is if the mileage on the odometer matches the mileage stated in the oil change sticker on the car's window or door. Also, is it consistent with the repair records? If the car is older without a digital odometer, check for physical tampering like marks on the odometer or misaligned numbers. Does the car show more wear on the brake pedal or rugs than is consistent with the alleged mileage? Part II provides more advice on what inconsistencies to look for. Obviously, the more options on the automobile, the higher the price. If you don't need power options in your automobile, such as power windows, power seats, sunroof, etc., avoid them. These are just more devices to break down and they are expensive to repair. Another factor affecting the price of the used car, truck, van or SUV is supply and demand. A simple and obvious example would be; in Alaska, the price of a convertible will be much less than it would be in southern California. More southern Californians want to drive convertibles, and southern Californian sellers of convertibles know that.